When one of my best friends got married, I decided to knit her a wedding present. Her recent move from California to Chicago suggested a sweater. I knew that what she missed most about West Coast winters was trees with leaves. 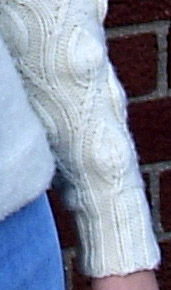 The sleeves are based on a twining vine leaf pattern taken from Barbara Walker's "A Second Treasury of Knitting Patterns." 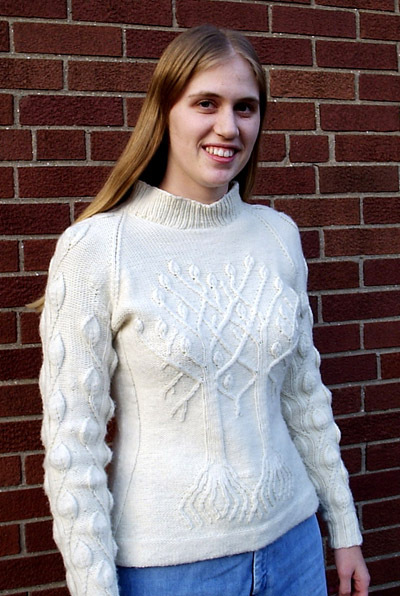 The front features an elaboration of the twining trees from "Charted Knitting Designs." 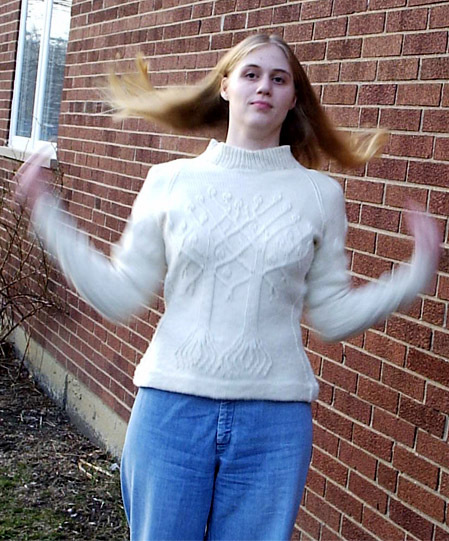 The sweater is made of soft merino wool, warm without being itchy. This pattern is designed to give slightly more experienced knitters a place to showcase their skills. Nonetheless, it should be possible for anyone who can handle cables to make it; all you need is the ability to read a chart and pay close attention to detail. The model is knit in undyed worsted-weight yarn from handpaintedyarn.com. Chart A and Chart C are PDF files. You will need the free Acrobat Reader to read them. You can find it here. M1p: Make 1 purl st. Lift strand between st just worked and next st by inserting left needle from front to back, p through back loop. Note: When pattern indicates that a certain number of sts has been increased or decreased during shaping, this does not include sts that have been increased or decreased in the course of working the stitch pattern. Using double-point needles, CO 36[36, 36, 36, 48, 48, 48] sts. Distribute sts between 3 needles (12[12, 12, 12, 16, 16, 16] sts on each needle), place marker and join to begin working in the round, being careful not to twist. Note: It is important to distribute sts as described above. When working sleeves, some instructions are given to be repeated "on each needle", or in other words, to be worked 3 times in that round. First Round: P1, k2, [p2, k2] to last st, p1. Repeat this round 13 times more. First Round: K1, p2, [k2, p2] to last st, k1. Repeat this round 19 times more. Note: There is no provision in the pattern for lengthening or shortening the sleeves. As written, they are 20 inches long. If you wish to lengthen or shorten them, it should be done now, by lengthening or shortening the ribbing a the bottom of the sleeve. The sleeve ends on a specific row of Chart B, and the raglan sleeve cap begins on a specific row of Chart C.
Next Round: [P0[0, 0, 0, 2, 2, 2], work Row 1 of Chart B, p0[0, 0, 0, 2, 2, 2]] on each needle. Work 14 rounds in patt as set, working through Rows 2-15 of Chart B.
Sleeve Increase Round: [M1, work to end of needle in patt as set] on each needle. 3 sts increased. Note: Do not repeat Rows 1-7 of Chart B; these are Set Up Rows. Repeat Rows 8-31 only. Work 11[11, 11, 11, 12, 12, 12] rounds in patt as set, purling new sts. Repeat these 12[12, 12, 12, 13, 13, 13] rounds 8[8, 8, 8, 4, 4, 4] times more. 27[27, 27, 27, 15, 15, 15] sts increased. Work 12 rounds in patt as set. Next Round: P1, m1, work in patt to last st of round, m1, p1. Repeat these 13 rounds twice more. 6 sts increased. Cont in patt as set until work measures 20 inches, ending with Row 16[16, 16, 16, 10, 10, 10] of Chart B. 78[78, 78, 78, 96, 96, 96] sts on needle. Next Round: P11[11, 11, 11, 9, 9, 9], place 12 sts just worked (incl. last 1[1, 1, 1, 3, 3, 3] sts from prev. row) on waste yarn. Place rem sts of first sleeve on spare circular needle, leave rem sts of second sleeve on double-point needles. Break yarn, leaving 12-inch tail. Using smaller circular needle and Crochet Cast On, CO 164[180, 196, 212, 224, 240, 256] sts. Place marker and join to begin working in the round, being careful not to twist. Work 11 rounds in 1x1 Rib. Next Round: Continuing in Rib as set, work 9[13, 17, 21, 24, 28, 32] sts, place marker (first front marker), work 64 sts, place marker (second front marker), work 9[13, 17, 21, 24, 28, 32] sts, place marker (side marker), work to end of row (end marker already placed at end of row). Next Round: Switching to larger circular needle, k8, p to 8 sts before side marker, k to end of round. Repeat this round 12 times more. Next Round: Remove crochet chain from CO a few sts at a time, placing live sts on spare double-point needle; work each st from body together in patt with corresponding st from CO edge. Hem is complete. Note: Due to large number of sts in Chart A, Size XS is worked without waist shaping. Next Round: K8, p1, work Row 1 of Chart A (ends at second front marker), p1, k to end of round. Work in patt as set to Row 113 of Chart A. Next Round: K7, ssk, p to first front marker, work Row 1 of Chart A (ends at second front marker), p to 9 sts before side marker, k2tog, k14, ssk, k to 9 sts before end marker, k2tog, k7. 4 sts decreased. Work _[12, 9, 7, 6, 6, 6] rows in patt as set. Next Round: K7, ssk, work in patt as set to 9 sts before side marker, k2tog, k14, ssk, k to 9 sts before end marker, k2tog, k7. Repeat these _[13, 10, 8, 7, 7, 7] rounds _[2, 3, 4, 5, 5, 5] times more. _[12, 16, 20, 24, 24, 24] sts decreased. Work _[16, 15, 16, 18, 20, 20] rounds in patt as set. Increase Round: K8, m1p, work in patt to 8 sts before side marker, m1p, k16, m1, k to 8 sts before end marker, m1, k8. Work _[12, 9, 7, 6, 6, 6] rounds in patt as set. Repeat these _[13, 10, 8, 7, 7, 7] rounds _[2, 3, 4, 5, 5, 5] times more, then work Increase Row once more. _[16, 20, 24, 28, 28, 28] sts increased. Cont in patt as set until Row 113 of Chart A has been completed. Note: ALL SIZES continue here. Joining Round: Work in patt to 6 sts before side marker, place marker (right front raglan marker), place next 12 sts on waste yarn, work Row 7[7, 7, 7, 1, 1, 1] of Chart C across held sts of one sleeve, place marker (right back raglan marker), k to last 6 sts of row, place next 12 sts on waste yarn, place marker (left back raglan marker), work Row 7[7, 7, 7, 1, 1, 1] of Chart C across held sts of one sleeve, place marker (left front raglan marker), k1. 281[297, 313, 329, 377, 393, 409] sts. Note: This point, one stitch past the left front raglan stitch marker, will now be the beginning of the row. You may wish to place a stitch marker here, but it will need to be moved each time a raglan decrease is worked. It may be more helpful, if desired, to place a safety pin in your work at this point and to move it up periodically. As work progresses, the raglan decreases will encroach on the front markers. When this happens, draw a vertical line 5-10 sts in from each edge of the chart and move the stitch markers inward to the point indicated by this line. (Or, if you prefer, remove the st markers entirely.) In either case, the front markers should be removed after Row 130 of Chart A has been completed. Next Row: Work in patt to 2 sts before right front raglan marker, k2tog, work next row of Chart C , ssk, k to 2 sts before left back raglan marker, k2tog, work next row of Chart C , ssk. Work 1 row in patt as set. Repeat these 2 rounds 13[17, 19, 21, 23, 25, 25] times more; Row 35[43, 47, 51, 49, 53, 53] of Chart C completed, all rows of Chart A completed. Work 1 more row in patt, working raglan decreases as set, completing Row 36[44, 48, 52, 50, 54, 54] of Chart C .
P16. Place next 6[6, 10, 14, 16, 20, 28] sts on st holder or waste yarn and turn work so WS is facing. K1, ssk, k13, cont in patt as set to left front raglan marker, k13, k2tog, k1. Turn work. Next Row [RS]: Work in patt, working raglan decreases as set. Next Row [WS]: K1, ssk, work in patt to last 3 sts, k2tog, k1. Repeat these 2 rows twice more; 10 sts rem on each side of front neck, between front raglan markers and front edges. Row 43[51, 55, 59, 57, 61, 61] of Chart C completed. Next Row [RS]: P8, k2tog, work next row of Chart C , ssk, k8. Turn work so WS is facing. Next Row [WS]: P1, p2tog, p to marker, work next row of Chart C , p1, k to last 3 sts, k2tog, k1. Next Row [WS]: P2tog, p1, work next row of Chart C, p1, k2tog. Next Row [RS]: K2tog, work next row of Chart C, ssk. Row 52[60, 64, 68, 66, 70, 70] of Chart C complete, 22[14, 10, 6, 8, 4, 4] sts of shoulder rem. Place rem sts on st holder or waste yarn. With RS facing, rejoin yarn to last 10 sts of back, placing center back sts on st holder. Next Row [RS]: K8, k2tog, work next row of Chart C, ssk, p8. Next Row [WS]: K1, ssk, k to 1 st before marker, p1, work next row of Chart C, p to last 3 sts, p2tog tbl, p1. Next Row [WS]: Ssk, p1, work next row of Chart C, p1, p2tog tbl. Place rem 22[14, 10, 6, 8, 4, 4] sts on st holder or waste yarn. Using double-point needles, k held back neck sts, pick up and k 3 sts in every 4 rows along left back neck edge, k held sts of left shoulder, pick up and k 3 sts in every 4 rows along left front neck edge, k held sts of front neck, pick up and k 3 sts in every 4 rows along right front neck edge, k held sts of right shoulder, pick up and k 3 sts in every 4 rows along right back neck edge. Work 18 rounds of 1x1 Rib. BO all sts loosely in patt. Graft held sts of body to held sts of sleeves at underarms. Wash sweater by hand and lay flat to dry, shaping as necessary. Ariel is a graduate student in mathematics at the University of Chicago. In her spare time, she reads, plays bridge, folds origami, and, of course, knits. Pattern & images © 2005 Ariel Barton. Knitter's Symbols font used courtesy of Aire River Designs-Copyright 2003. Contact Ariel.